Are you ready for another survey-taking site? Are you ready to earn some extra money? Then OpinionSite might be able to help you with that. OpinionSite is a site which pays individuals or members to complete online surveys. Founded in 1997, this company is part of the Universal Survey, Inc. group of companies. If you're a member of this panel, you can join as a consumer and/or a healthcare professional. The types of surveys you receive will depend on how you are signed up. With this site you can redeem your earned points and cash out for mailed checks, Amazon, iTunes, or Walmart gift cards. It's not all that common anymore to see survey panels paying via check, so this makes OpinionSite a bit unique. OpinionSite works very similarly to most other survey sites. You would just need to sign up with a legitimate email account which will be verified. You will also need to fill out your name, address, and other basic contact information. There is also some basic profiling information to fill out as well. Then you wait for OpinionSite to send you surveys via the email address you provided. How Much Money Can You Earn With OpinionSite? The actual money you make will depend on the number of surveys that you qualify for and complete. Each survey rewards qualifying members with no less than 50 points. You must reach 14,000 points to be able to cash out at $10. A check will then be sent to the address that you provided, and it can take up to 6 to 8 weeks to receive it. As with all survey panels, this is only good for a little extra cash here and there. You cannot depend on OpinionSite for any sort of reliable income. 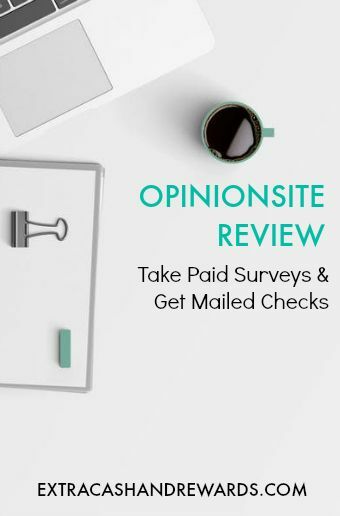 We recommend signing up with more than one survey panel to maximize the amount you earn from surveys. Can People Outside of the US Take Surveys For OpinionSite? Currently, OpinionSite is only open to US residents, but the parent company, Universal Survey, does allow other countries to participate. You must also be at least 13 years old or older to join. However, if you are between the ages of 13 and 17, you'll need parental permission first. Does OpinionSite Have a Referral Program? It doesn’t appear that they have a formal referral program, but you certainly refer friends and family. There will be a place on their website to refer others. There is currently no mention of an app. OpinionSite is smaller and lesser known than other survey sites, so it may eventually develop an app. What Do Others Say About OpinionSite? The reviews are mixed. It seems that participants either really like it or really don’t. The biggest complaint is spending 15 to 20 minutes on a survey to find out that you don’t qualify. Another complaint would be to have a faster turnaround time for payment. One thing I should point out is that even if you do disqualify from a survey at OpinionSite, you will still earn at least 50 points for your time. This makes them one of those rare survey panels that will pay you even if you screen out or disqualify. Then there are those that think this is one of the better survey sites. Ultimately, you'll need to try it for yourself and see if your experience differs. OpinionSite does appear to be very responsive to complaints about them posted at SurveyPolice, so this is a good sign. Despite the bad reviews, they are at least trying to resolve matters. Many survey companies don't bother. Go to the website and begin filling out the forms at the link provided here. Good luck.